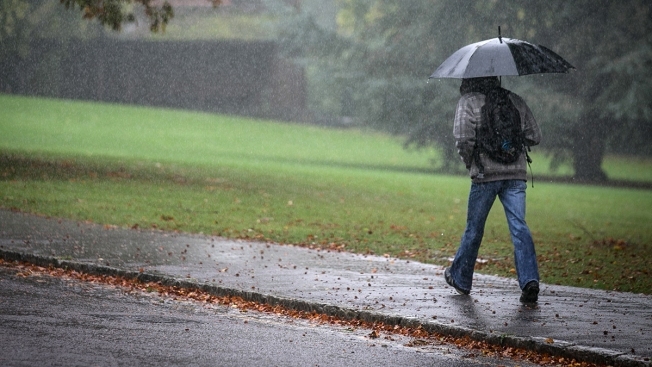 File photo of man walking with umbrella and backpack in Bath, England in 2014. Widespread showers dampened Bay Area roadways and soaked the hills Friday, but the wet weather is expected to clear by Mother's Day. “By Sunday, there will be about a 10 to 20 percent chance of rain but the showers will be much more isolated,” National Weather Service meteorologist Bob Benjamin said. Despite Friday’s moisture, rain totals will only reach one tenth of an inch in most areas, Benjamin said. Meteorologists expect occasional showers on Saturday morning. Three-day rainfall totals will peak at a quarter of an inch to a third of an inch, he said. “The rain is moving through rapidly,” Benjamin said. High pressure will build in next week, bringing sunshine and warmer temperatures back to the Bay Area.